I love the articles you post about the structure of Circle of Fountains. 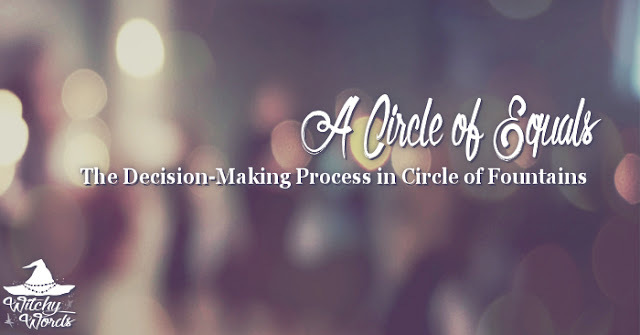 I was wondering if you might address the decision making process that you use? My own coven is writing its bylaws and very few that I have found have an everyone is equal mentality like you do. I would love to know how you come to group decisions and what measures you have put in place to handle dissent. Thank you so much for being as open as you are with your coven information. It is a delight to follow along. As a non-denominational and non-initiatory circle, Circle of Fountains already strays outside the coven-structure norm. We're divide the sabbats up equally so that each Primary Member leads one, taking the pressure of ritual creation off of the coven as a whole. We divide the Novice classes up so that each person teaches two of the 13, avoiding exhaustion and overexertion as well as encouraging variety. CF was created in a way that intentionally defies the standards. The same can be said about our voting system. Circle of Fountains uses a close-to-equal voting system. All major decisions are handled by a discussion and vote that typically takes place either at our Primary Member meetings or through our Primary Member group chat. In these, I will state the topic we're voting on and either utilize a show of hands or a "Yea/Nay" vote to determine the outcome. This suffices for the vast majority of decisions - I would wager 99.9% - and there's rarely a need to go the extra step. For the very few times where we have a member that strongly disagrees but is on the lower end of the vote, I approach it in two ways. My first step is to have a private conversation with the member to find out their concerns or issues. This requires having a person whose job is to mediate circumstances of disagreement. In our case, as the coordinator, I take that position. I try to make sure they’re heard. Secondly, I try to explain it from the other side’s vantage and see if we can meet in the middle. In this position, it’s essential that that person can see both points of view clearly. Certain circumstances have mitigated that I explain a side’s point of view for which I did not personally vote. In the end, we are a majority-wins group. If the above attempt does not work, the majority vote stands and we must move forward based on that. This is the rule all members agree to when they join. If the member absolutely cannot agree to the situation, they can opt out of the activity. For example: In one particular case, we were presenting a public ritual that involved the backstories of a certain god. A member found verified sources to back her version of the story and all but one member agreed to utilize it in the ritual. That one member was adamant that that’s not how that god would work, even threatening at the time to drop out of the organizing of said event because of it. I had that member step away from the situation and clarified that the sources the first member found were educational and reliable sources, and that UPG could not be solely relied upon in these scenarios. I implored her to do further research but she would not have it. I then had to stand firm that we would be moving forward given the majority vote and that, if said member could not participate, I understood. The next day, that member apologized and had found a workaround to the situation through research, in which everything resolved. In this scenario, I think the second member was working on a lack of sleep and was particularly irritable. A good night’s rest gave her a chance to reset and rethink the situation. An important aspect of any group work, be it religious or not, is the ability to make decisions in a calm and collected manner with impartial judgement. Each member of any organization will be required to give and take – ideally in equal amounts. The reality, however, is that disagreements will occur. I expect that all members of Circle of Fountains are adults who can handle “not getting their way” every time, so to speak. I also have a zero tolerance policy for fights, gossip, drama and other such actions that often create the downfall of many organizations. In such, I will "end" the ensuing argument by shutting down the discussion until everyone can cool down and I've had a chance to talk with each member personally. Ensuring that your expectations are made clearly and up front to potential members, and enforcing them without exception, can help you avoid situations later on. Best wishes to you Rhea, and to all looking to form a coven of equals!